Many new designs for Shaista winter fabrics 2012-13 collection were released yesterday. Like the previous Shaista winter range 2012-13, the new Shaista winter fabrics 2012-13 are also quite brightly colored. The fabrics are embroidered and quite stylish. Patterns with traditional motifs can be seen in the new collection of Shaista. Some of the designs are available in different color schemes also. Thus, there is a lot of variety in this collection of Shaista. There are suits for all age groups. All suits have three-pieces of fabrics namely dupattas, shalwars and shirts fabrics. 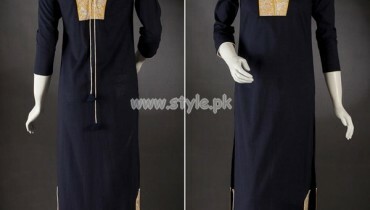 Shaista winter fabrics 2012-13 is an attractive collection for women. Shaista was founded some years ago by UB fabrics. However, it has become popular recently. This is due to the catalogs of stylish dresses that it released in 2012. It released beautiful lawn collections in the summers and after that, it released quite a few winter collections for women. The brand is now known for its stylish designs and good quality fabrics. The designs are made according to the tastes and preferences of Asian women. Shaista fabric collections are now sold through selected fabric shops in Pakistan. Now big fabric shops also carry the fabrics of the company. The new Shaista winter fabrics 2012-13 can be seen below. These are just some of the new Shaista winter fabrics 2012-13. You can see the full range at big fabric shops of Pakistan. The facebook fan page of Shaista also has more designs of the collection. You can gain more details about Shaista winter fabrics 2012-13 and the brand in general through its Facebook page. The address has been provided. So, do check out the collection right now. If you want any of them, visit a fabric store near you soon for details and for purchasing the fabrics.